We’d love your help. 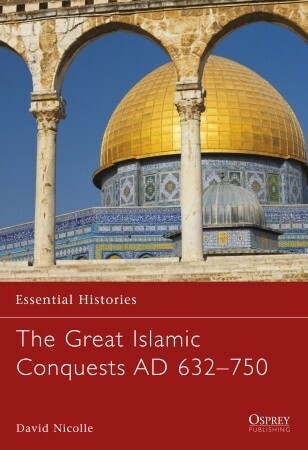 Let us know what’s wrong with this preview of The Great Islamic Conquests AD 632–750 by David Nicolle. Few, if any, centuries in world history have had such a profound and long-lasting impact as the first hundred years of Islamic history. In this book, David Nicolle, a former member of the BBC's Arabic service, examines the extensive Islamic conquests between 632 and 750 AD. These years saw the religion and culture of Islam, as well as the Arabic language, erupt from the Ar Few, if any, centuries in world history have had such a profound and long-lasting impact as the first hundred years of Islamic history. In this book, David Nicolle, a former member of the BBC's Arabic service, examines the extensive Islamic conquests between 632 and 750 AD. These years saw the religion and culture of Islam, as well as the Arabic language, erupt from the Arabian Peninsula to spread across an area far larger than that of the Roman Empire at its greatest extent. It also saw the abrupt collapse of the Persian Empire, as well as the permanent withdrawal of the Romano-Byzantine Empire and its associated cultures, along with Christianity as a ruling faith, from the Middle East and North Africa. To ask other readers questions about The Great Islamic Conquests AD 632–750, please sign up. Good summation of the wars of conquest by Islamic forces after the death of Mohammed. If you want a simple military history - this is a good book to read. What bothered me was the author came across as sympathetic to the Islamic quest to conquer more land and people. He mentions the tolerance of the religion towards the conquered people. That really bothered me - because people shouldn't be conquered - therefore if you're going to give your opinion on how tolerant they were - maybe they should b Good summation of the wars of conquest by Islamic forces after the death of Mohammed. If you want a simple military history - this is a good book to read. What bothered me was the author came across as sympathetic to the Islamic quest to conquer more land and people. He mentions the tolerance of the religion towards the conquered people. That really bothered me - because people shouldn't be conquered - therefore if you're going to give your opinion on how tolerant they were - maybe they should be condemned for conquering in the first place. Like Hitler was condemned for doing the same thing. Speaking of Hitler - you cannot talk about the European war without mentioning the holocaust. Nicolle failed to mention the massacres that took place by the tolerant muslims. He briefly mentions that other religions are not allowed on the arabian peninsula - and that the other religions ceased to exist. He didn't mention how or why - which is a huge negative. That'd be like saying six million jews ceased to exist - but not mentioning how or why. There were three jewish tribes near Mecca and Medina. Mohammed wiped out two. Killed all the men and enslaved the women. The third tribe was forced out. You were given a choice: submit to Islam, pay a dhimmi tax, leave... or die by execution. To not mention this in the book is unconscionable. The Battle of Tours is seen by the author as insignificant. He says it was just a raid - nothing more. The initial invasion of Spain was just a raid. It lead to a full fledge invasion - and the muslims stayed for almost 800 years. He ends the book by saying that the Islamic empire didn't cause more world division - but rather created a bridge between the east and west. I couldn't disagree more. I had to read this for a class and unfortunately it is not very detailed- it is pretty much a picture book. It also down scales the level of Muslim atrocities during the Islamic expansion, in favour of a view of a tolerant religion. Sure, Islam was very tolerant (relative to the other religions of the day), particularly while Muhammad was alive, but they were also brutal just like most other empire's of the time. A very clear (and by necessity) concise overview of the growth of Islam from the teachings of the Prophet Mohammed to the collapse of the Umayyad Caliphate in 750. One of the youngest religions in the world is one not taught very often in Western schools in the 80s and 90s, and so I knew little about this period other than the interactions with Byzantium, and (later) as a 'cause' for the Crusades. Nicolle clearly identifies the driving and dominant features of this era and whilst there were mini A very clear (and by necessity) concise overview of the growth of Islam from the teachings of the Prophet Mohammed to the collapse of the Umayyad Caliphate in 750. This book doesn't deserve 5 stars but it also doesn't deserve the 1 star and bigoted anti-muslim reviews it has received either. This is my way of balancing out the universe. Dr. David C. Nicolle (born 4 April 1944) is a British historian specialising in the military history of the Middle Ages, with a particular interest in the Middle East. David Nicolle worked for BBC Arabic before getting his MA at SOAS, University of London. He gained a PHD at the University of Edinburgh. He lectured in World and Islamic art and architecture at Yarmouk University, Jordan. He was also Dr. David C. Nicolle (born 4 April 1944) is a British historian specialising in the military history of the Middle Ages, with a particular interest in the Middle East.